CALL TO ACTION; what will you do? 11/30/16 Chairman Dave Archambault II today issued a proclamatino in support of water protectors who face continued civil rights abuses and excessive use of force by law enforcement. 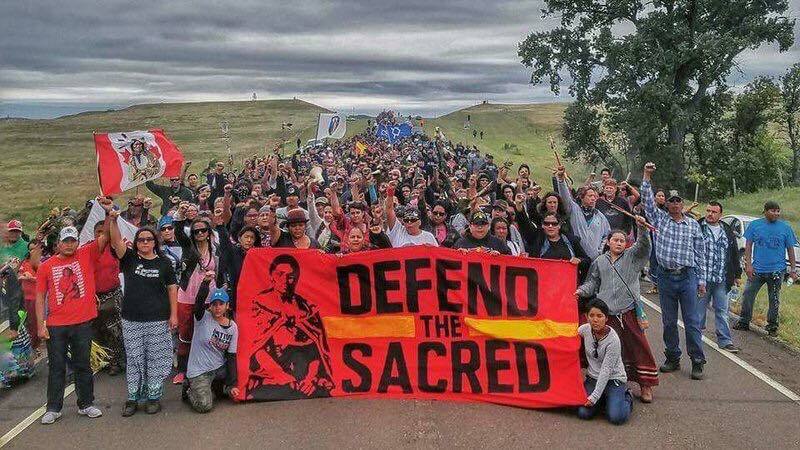 ​11/27/16 Global #NoDAPL Month of Action - Find a Target. Take Action. EVeryday of December. 11/23/16 Prayer Gathering - Bismarck? 11/22/16 Front line photos at the Backwater Bridge from Rob Wilson Photograph. "Charles Jordan beaten and bloodied and has a BAG PUT OVER HIS HEAD by police in Bismarck North Dakota. He says he is a military veteran and was attacked for picking a flower. He says his shoulders were dislocated. " NEW 11/17/16 Bismarck action - Johnny Dangers 29:00 11:55am or 9:55am? 11/15/16 Prayer Circle for Missing and Murdered Indigenous Women. It is not open yet due to Water Protectors praying. 11/7/16 DNB Bank, one of the financial institutions that is a part of the $2.5 billion loan thats funding the Akota Access Pipeline is considering cutting its financing to the project. 11/6/16 Cemetary Action in Bismarck - What if they dug up YOUR ancestors?